I don't like romance novels. I hate them. But I love romance IN novels. 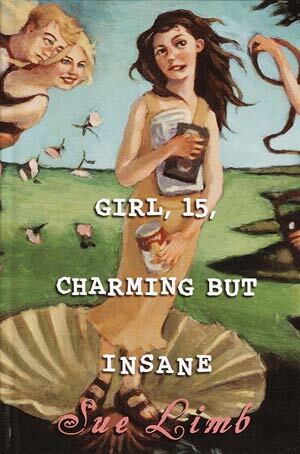 This is the sequel to the last book I read, Girl, 15, Charming But Insane. It's a funny story, with a lot of romance, but the romance is not the story. In the last book Jess decided she was not truly in love with the boy she was obsessed with (Ben) and she realized her true feelings for her best mate, Fred. This book picks up a few months later after Fred and Jess have become an item. Thinking she's going to have the best summer in the world now that she has a boyfriend, Jess can't wait for it to begin. And then she gets the news that her mum has scheduled a 2-3 week road trip to go see her Dad and to see boring literary historical landmarks along the way. Jess is devastated. How will she survive without Fred? But more importantly, how will Fred resist the temptations of the evil beautiful women playing tennis sexily? Especially her best friend, the blond perfect Flora. Jess and Fred are hysterical together. Instead of the usual sappy romance, they're funny. They insult each other but it's in a loving way. Jess is a great character and I loved her overreactions to everything (she constantly feared Fred would be cheating on her and blew everything out of proportion whenver any girl talked to him). Although they kept in pretty close contact because of text messaging on their cell phones, Jess still freaked out and there was still miscommunication and drama. You'd think when someone is in constant contact there would be no misunderstandings , but with teens there are ALWAYS misunderstandings. I loved this book. I'd like to hear more stories about Jess! I am not a 6th grade boy. And I liked this book. My middle school book group (made up of 6th grade boys. ALL boys. ALL 6th grade. Feel my pain. ;-) ) chose this book because they wanted to read a boy book that wasn't fantasy. And because the ringleader had already read it. I think I'm probably the last person to have read this, so I'll skip the summary. Everyone knows all about the Alex Rider books now. He's a teen James Bond, a reluctant spy-hero, fighting the evil forces that killed his spy-Uncle. It's very easy to read--the language and plot are perfect for those reluctant reader boys. It's action-packed and reads like a movie (no surprise a movie will be made). Alex is a likeable boy, he's capable of taking care of himself, but makes mistakes along the way. He's not cocky or arrogant (at least not in this first book, I can't speak for the rest of the series). It's a very quick read, particularly because it's so action-packed it's hard to put down. You want to keep reading to see if Alex can get out of the mess he's in. Overall thumbs-up; PERFECT for boys, especially middle school. On My Nightstand: waiting for Sir Thursday! !